Business and higher education, given their importance to our country and its welfare, need to do a better job of communicating with each other. We have different perspectives and ways of accomplishing goals, but that shouldn’t stand in the way of success. Alarm bells went off on college campuses when a poll a few years ago found that one-third of American business leaders said higher education institutions weren’t graduating students with the skills and competences their businesses needed. From Syracuse University to the University of South Carolina to the University of Southern California, there are multiple current examples of how institutions are aggressively connecting the classroom to the real world. Now is the time for the education world to come together with the business world in support of working learners, those employees who are receiving paychecks while also trying to earn a degree or credential. The need to improve support for working learners appears to have bipartisan support. During the recent State of the Union, President Trump called for the country to “invest in workforce development and job training” and for the opening of “great vocational schools.” Democratic Rep. Joe Kennedy delivered his party’s response from a career tech high school and his colleagues have proposed policies to help working learners. In fact, the skills employers say they look for on resumes are exactly the ones that working learners secure through their dual roles. The National Association of Colleges and Employers found that these skills (often given the misnomer “soft skills”) are leadership, ability to work in a team, communication skills (written), and problem-solving skills. ACT’s Center for Equity in Learning examined a nationally representative cohort of first-time freshmen over a six-year period to understand when and why working during college contributes to differences in students’ academic and career success. The data showed that most students (59 percent) worked during college. The research revealed that students who worked more than 15 hours each week are often from financially challenged households and tended to be less academically prepared for postsecondary learning than those who worked less or not at all. They are also dedicated and hard working; students who worked more often had multiple jobs (40 percent) and typically worked every week (61 percent). In fact, we believe working a more moderate number of hours — with support from both their education institutions and their employers — is a key strategy for students from low-income families trying to succeed in college. Our report also notes that employers who adapt to accommodate the real-world demands on college-aged working learners position themselves, and society as a whole, to benefit for years to come from the ambition and hard work of these students. What’s more, employers can create a culture of supportive learning inside their companies that can have a positive effect on recruitment and retention of talented, productive employees. For instance, employers may provide reminders to senior staff and supervisors, that as the end of the semester approaches, they should be mindful of overscheduling working learners as they prepare to take final exams. It could mean committing to scheduling shifts well in advance so working learners are able to better anticipate and manage demands on their time at work, school, and in their personal lives. This could also mean alerting staff in and around college towns that helping working learners to succeed is part of a company’s way of giving back to the wellbeing of the community. Currently there is a national TV ad airing for a fast-food chain that celebrates a minimum-wage worker getting into college. While that sentiment is laudable, getting in is merely the first step. Students who are working and learning still need to figure out how to pay the tuition, fees and living expenses while juggling demands on their time. Even then, only 53 percent of all students earn a college degree within six years. What about an ad that highlights how large employers partner with working learners to give them shifts that fit their class schedules? We also believe it’s imperative to deliver more than just laudatory speeches about career and technical education. We call on Congress to maintain and expand funding for the federal work-study program, as our research found students worked fewer hours (and had more time to focus on their studies) when they participated in work-study arrangements. We understand that business is under incredible strain and that ultimately CEOs are accountable to the shareholders or other owners of the corporation. Yet for a quarter-of-a century, through recessions and wars, the Committee for Economic Development has been successfully engaging business leaders in solving problems in the nation’s interest. 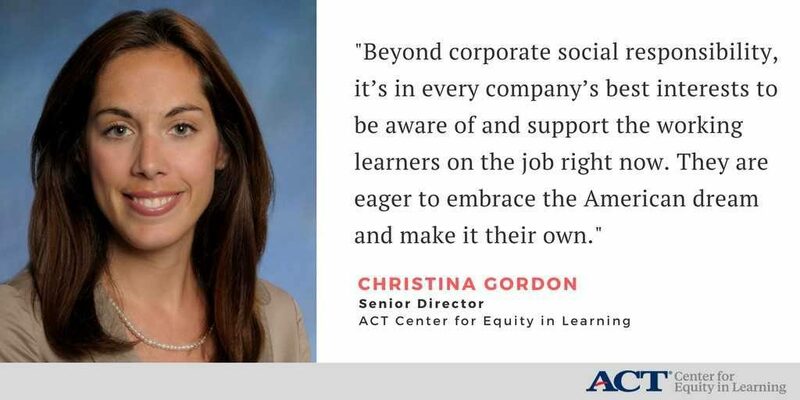 Beyond corporate social responsibility, it’s in every company’s best interests to be aware of and support the working learners on the job right now. They are eager to embrace the American dream and make it their own.